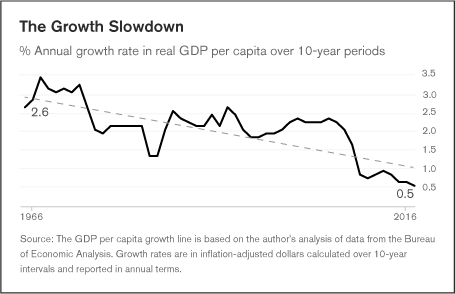 U.S. economic growth is languishing below its pre-recession pace. A Gallup study, published in partnership with the U.S. Council on Competitiveness, finds that the problems go back much further. Learn why and what the long-term fix is. We've been told that the economy is on its way back. In the seven years since the Great Recession, job growth in the United States has been steady and unemployment has fallen from 10% to just under 5%. Booming tech and professional services sectors should denote a healthy economy and productivity growth, but a new Gallup analysis identifies fundamental weaknesses in the U.S. economy that have emerged over decades. Productivity decline is the reality. Economic growth has gradually fallen since the 1970s and 1980s, and three large sectors bear primary responsibility for the malaise: healthcare, housing and education. In 1980, healthcare, housing and education claimed 25% of national spending. By 2015, that share had ballooned to 36%. The costs to both national and per capita GDP are enormous. As the costs of these services rise, the value they generate -- in terms of health, learning and shelter -- has stagnated or even declined. When the quality-to-cost ratio falls, living standards do as well. Gallup's analysis, in collaboration with the U.S. Council on Competitiveness, presents the causes and effects of long-term U.S. declining productivity growth, and makes a case for a new growth strategy. Share of Americans surveyed by Gallup who say that now is a good time to find a "quality job"
The long-term impact of higher costs for healthcare, housing and education has been to dampen Americans' productivity, consumption, quality of life, ambitions and career choices. No Recovery: An Analysis of Long-Term U.S. Productivity Decline is a report identifying the roadblocks to national economic recovery, detailing the damage brought by slow recovery and offering a new growth strategy.